The Kennedy Institute of Rheumatology is a world-leading medical research centre where discovery research drives development of transformative therapies for chronic inflammatory and degenerative disease. Directed by Professor Fiona Powrie FRS, the Kennedy Institute has more than 25 research groups working in the areas of immunity and microbiome, inflammation biology and tissue remodelling and regeneration. The Institute houses approximately 180 researchers, support staff and students representing more than 27 nationalities. An overarching goal is to uncover key biological processes that promote health and provide understanding of how these pathways malfunction in disease. Investigators at the Institute take a multidisciplinary approach incorporating molecular and cellular biology with analysis of disease models and interrogation of patient tissue samples. This is enabled by outstanding core technology platforms at the Institute and at other research institutes both on the Old Road Campus and throughout the University. The Kennedy Institute also has close ties with nearby clinical centres in Oxford and beyond that provide a gateway to patient cohorts in inflammatory arthritis, osteoarthritis, cancer and inflammatory bowel disease that enable translation from bench to bedside. Investigators at the Institute lead the Arthritis Research UK Centre for Osteoarthritis Pathogenesis, which seeks to create a seamless transition from laboratory discovery through pre-clinical modelling to clinical translation. The Institute also runs the Arthritis Therapy Acceleration Programme to accelerate the uptake of early experimental trials based on observations from pre-clinical studies. 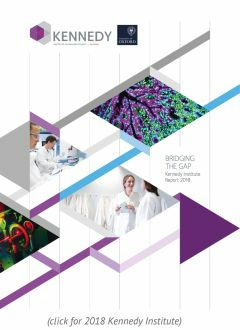 The Kennedy Institute is historically linked to the Kennedy Trust for Rheumatology Research (KTRR), but also receives funding from numerous other sources including Arthritis Research UK, The Wellcome Trust, the Research Councils, the European Commission and a variety of smaller charities. The Institute was formed in 1965 as the Mathilda and Terence Kennedy Institute of Rheumatology, in London. In 2011, the Institute joined the University of Oxford as an independent constituent Institute within the Nuffield Department of Orthopaedics, Rheumatology and Musculoskeletal Science (NDORMS).